There would be many questions in my head if I were beginning something like the CARER year 3 – questions I might ask someone that was already doing it, for instance. 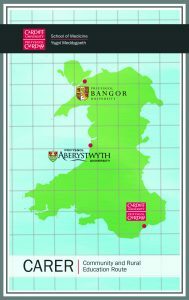 Questions like “Do you feel like you’re missing out?” (no), “What’s it like so far away from Cardiff?” (ask the North Wales students that! ), “Why did you decide to do it in the first place?” (one-to-one teaching; independence), and so on. Perhaps one question that slowly bubbles up once some of these have already risen is “what’s an average day like for CARER students?”. Besides the fact that there is no average day, making the question impossible, I also cannot generalise to CARER students, plural. We’re all different: the surgeries, the patients, our G.P. mentors, the landscapes all through Cardiganshire and Powys and Gwynedd. It can be snowing over the bogs in Tregaron while the sun shines in Borth and the rain flies sideways in Machynlleth. I can be helping in a minor operation while other students are doing baby clinic or seeing patients on home visits. But rather than continue with tasks and things I cannot do, I thought it better to describe at least one CARER student’s day. It is not representative; I don’t think there has been any day so far which was typical. The sun rises at 8:04 AM, but by this time I’m de-icing the windscreen of the car. The mornings in late January have become beautiful, crawling a little further into daylight every day so that by now as I set off from Aberystwyth and head North the sky is clear. Orange and pink light scatters from hilltops to the East over rivers almost overflowing their banks and sheep that stare with dull inattention. The road goes winding between neighbour hills which either shelter close bushes and a few sparse trees or host wind turbines which lazily whir in perfect synchrony. By the time I arrive at the Cemmaes Road surgery the inside of the car has heated up and the sky is full of light. There are a few patients sitting quietly in the waiting room as I arrive with a few minutes to spare before my first patient. I set myself up in one of the consulting rooms. I pop my head round the door of Dr Louise Hyde, my G.P. mentor, to let her know I’ve arrived and that I’ll call in my first patient when he arrives. With this I log in to the computer and get out a pad of paper and my stethoscope, before reading the patient’s recent notes. I have about five minutes to learn some of his background before I see from a red mark on the monitor that he’s arrived and is in the waiting room. In theory he’s had some dreadful fractures from last year and has recently had lots of hip pain. To my surprise I am greeted with a seventy-something chap jumping up from his chair – admittedly holding crutches – and springing forward to meet me with more energy than men half his age. In his own words he tells me what’s been happening recently and I try to keep my mouth closed. One of the locum G.P.’s at the practice is a firm advocate for a minute – the ‘Golden minute’ – where after inviting the patient to give their story you keep your lips sealed. And, true to form, the entire story from this gentleman’s perspective unfolds. The questions that enter my head are telepathically received and before I can open my lips he has answered every single one. After shattering both of his heels falling off a ladder last year he has had surgical fixation of both of them – he shows me the X-rays, where his feet are rammed full of what look like metal pistons holding all the pieces together. He recovered in record time, surprising the orthopaedic team by hopping onto the bed in his outpatient follow-up when they had thought him wheelchair bound, but now he has new pain in his hips. When I examine his legs they are strong and springy, and he casually explains his physiotherapy regimen that he has followed religiously every day, as well as at least an hour’s walk every day with his crutches. “I think this is a case of trochanteric pain syndrome – what we used to call trochanteric bursitis.” I see my patient’s face change as he faces Dr Hyde. Her face changes in response, matching his expression. Now it is his turn to change. “Ah! I was given some different stretches a while ago, but I stopped doing them. Look,” he says, turning on his side in the chair and raising his leg straight from the hip. “But it got too painful a few weeks ago,” he explains. With a few more deliberations things are brought to a close. Satisfied, he exits, thanking us both very graciously. The next patient is already here. Time is quite slippery with patients, focus on their story spinning the hands of the clock faster than expected. She is a charming lady with black hair carefully framing her head and a large brooch glittering on her cardigan. She moves more slowly than my first patient, owing to some heart trouble. She is also in her 70’s, and was seen before the weekend by the advanced nurse practitioner. She had an electrocardiogram – or ECG for short – before being booked in again for a review of it with the doctors. She scares me quite badly at one point in the consultation. It happens like this. She has a type of heart trouble – angina, a pain in the chest when stressed or working hard – and recently it’s been happening more than it used to. She’s had for some time a spray to use under her tongue to widen coronary blood vessels and supply the heart with more blood. Recently she’s had to use it a lot more than in the past. In fact, she mentions casually, she had a bit of an attack on Friday, the day after her last appointment. I begin to question her. Yes, it was a heavy pain on her chest – and do you know, she says, it went all the way down my left arm, like this, and it went up into my jaw, while I was on the phone to my friend. I double check what she said. Yes, my left arm and my jaw. I see, I say, now just a little more worried. And did the pain start quickly, or did it creep up on you? Oh, she says, it happened slowly. And what did you do next? Well, I took my morning ibuprofen, for my arthritis, and I used that spray, and I took some aspirin as well. Did it help?, I ask, not urgently but keenly focussed on her answer. Yes – yes, it went away in about thirty minutes or so. Now I take the patient’s blood pressure, press fingertips onto her ankles and her back, take my stethoscope and listen to her heart and lungs, check her pulse, etc. I come back to questions – is she too breathless to go shopping? Can she get up the stairs? Is she sleeping normally? and so on – then I begin typing up the notes and send Dr Hyde a message to come through when she’s ready. I bring up the patient’s ECG and current medication while presenting the case so far, looking straight into the doctor’s eyes as I explain. In particular, the gradual onset, central and heavy chest pain, that radiated into the left arm and jaw and seemed to be relieved. I hope my eyes convey a question: “Is she alright?” Dr Hyde reassures both myself and the patient, explains that for the moment her current medications for angina and blood pressure need to be modified and that we should book her to have an appointment in Bronglais hospital with the cardiology team. The good news is that this lady is well at the moment: her pulse was a reasonable rate, it was regular, she has no signs of congestive heart failure and her previous ECG was normal. An appointment with cardiology will make sure she gets more detailed care. “Sharp, or blunt?” she moves the point to the opposite end of the oval. “And again, sharp, or blunt?” We wait a minute or two – he can still feel the point. It is time – the local anaesthetic has worked – and the doctor makes a neat first incision. Once or twice the patient goes to talk while the scalpel is hovering above his skin, and my brain instantly fills with the image of him accidentally impaling himself as he tries to crack another joke. But he stays still. The face and neck are well supplied with blood vessels, and as well as a scalpel Dr Hyde is using an electric cautery machine to zap the ends of a few vessels closed. The bed is low down and I am bending forward over the patient, which is perhaps why I suddenly feel light headed. I explain to Dr Hyde that I’m going to sit down for a moment, and within a few seconds my vision clears up. Soon I am back at the side of the action, feeling silly but glad I didn’t have to leave or worse, actually pass out. The small ellipse of skin is just now finally being gently taken off and it then drops into a pot to be sent off for analysis – not because Dr Hyde thinks it’s suspicious or worrying, but as a routine matter. With lunchtime still a few minutes away I drive the short hop into Mach to the community hospital, where I go to meet a patient. She has had problems with pain relief during her stay so far and I am hoping to get her consent to be followed up by me in more detail for some coursework. I explain the project I have to do, what it will mean for her – she will have to endure my interrogations twice a week on how her care is progressing and whether things have gone well or poorly, as well as running through with me her medical background and her social history. It will hopefully mean I become an expert in her case, and know exactly what is happening with her. I leave the consent form with her so that she can decide to sign it in the next few days, ask for her previous notes to be kept a few days longer so I can read them before they are sent off, then jump back in the car to Cemmaes Road for lunch and my afternoon clinic. The sun which has been absent for the past three months or so now shines bright in the sky, surprisingly strong. For a long time it’s been gloomy brooding clouds overhead in the daytime, and a long night, only finishing as I arrive in the morning and beginning again before I drive home. I have lunch and chase up a few loose ends before my bloods clinic starts. Normally blood samples are taken by the nurses, but I asked for lots of practice and as a result I now get allocated half days where I have about 12 patients come through for all sorts of tests – with all kinds of veins in their arms. At the start of the year I was quite apprehensive, having only had two practice goes on other medical students before what seemed to me like being thrown in the deep end. Now I settle into a routine, bringing up each patient’s notes, filling out the test requests on the yellow laboratory slips and then calling the patient in. Today the tests are for all sorts of things: a medication review, ulcerative colitis, intermenstrual bleeding, possible malaria (for this I have to ring Bronglais microbiology department to ask which colour blood bottle the sample should be in) and one or two general checks, to give some background to problems like recent falls and dizziness or tiredness and fatigue. To my relief and pride I get blood first time on every patient, and even receive a few compliments. “Oh, I hardly felt it!” “That didn’t hurt at all,” and “is that it?” My last patient booked in slowly inches into the room guided by her daughter, and to my surprise has excellent veins despite nudging ninety years old. She tells me that she didn’t feel a thing. She goes next door straight away into an appointment with Dr Hyde – she hasn’t been to a doctor in years and years, and is only now having some problems. About two or three minutes later there’s a knock on my door. Being as gentle as I can be, I place the sticky gel pads on the limbs and across the chest of the lady who I have just taken blood from. She stares up at me calmly as I untangle the mass of ten electrodes and clip them in place, before Dr Hyde tells the patient to stay still while her heart trace is recorded. Then the printer grumbles and whirs, and lots of black squiggled lines jag up and down graph paper. The patient gets up slowly, the electrodes and the pads come off. She gets her jumper over her head and the halo of fine white hair that surrounds it, and again her daughter helps her down the corridor to Dr Hyde’s room. I round up a few last bits and pieces, check I haven’t forgotten anything, log off the computer and say goodbye for the day. I am just a few minutes too late for the daylight, but there is the faintest purple shadow over the Dyfi valley and the green hills. Racing back to Aberystwyth, I make it just in time for the warm up with the university athletics society. A warm up is definitely needed at this point – the temperature is dropping quickly and there was a terrific gale blowing about the town all of the day before, doing its best to rip the roof of the house during the night and shrieking round us during the day. At the end of the week there is a cross-country event coming up, so when we have our breath back the talk is of what to do in town to celebrate afterward. After an hour on the track I am back home, where my housemates are cooking and there’s hot water for a shower. It’s easy to get to sleep at night – even if the wind was howling, I’ve been on the go all day. I could probably sleep if the neighbours built a drum kit from frying pans and fire alarms and tested it out for the first time at midnight.